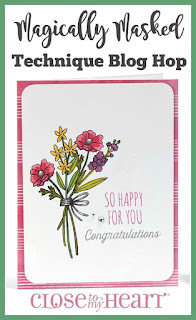 Thank you for joining us on this Blog Hop with lots of Masking ideas and tips for you... A Blog Hop is a 'circular' group of Blogs that you 'Hop' to (or click the link to) that will give you lots of tips, techniques and inspiration for the topic of the Blog Hop. I hope you enjoy your time with us and enjoy the projects. If you came from Michelle Loncar's Blog you are on the right track! Masking is a marvelous and fun way to get images to look like they are behind something or in something. Such as a bouquet of flowers, some flowers are behind others. -	Stamp the image you want to ‘be in the front’ of your completed stamped image on a piece of thin paper, such as typing paper and cut it out, just inside the lines. This is your ‘Mask’. -	Place 2 in 1 Glue (Bonding Memories Glue) on back of your mask and allow to dry. -	Stamp the image you want in the front of your completed image FIRST, then place your mask over the image and stamp the rest of the images over the mask, being sure to press (Not smoosh) where the stamp goes over the mask to make sure the image goes right up to the focal Image. Isn’t this the CUTEST little dinosaur you’ve seen!?? I did just a tiny bit of masking on his head by putting the Birthday hat on it. On this card I stamped the Hat FIRST, because it will be in Front of his head. I also stamped it on a scrap paper and made it a ‘Mask’. Then I stamped the dinosaur over the mask so it looks like some of his head and scales (??) are under his hat. This is a Fun Technique to do, have a great time playing! 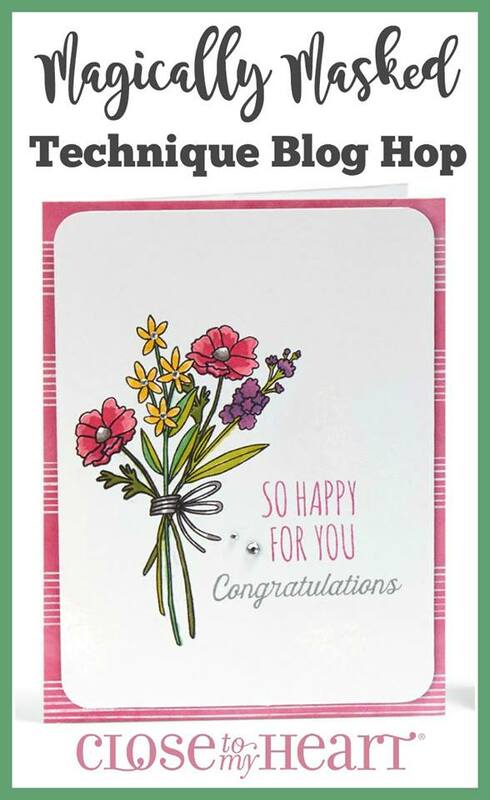 Hop on over to Catherine Farnsworth Nowak’s Blog to enjoy more great projects. What a cute Dino. Adding the hat made him even cuter!